How Often Should I Bathe My Shih Tzu Puppy? Shih tzu puppies require less grooming than their older, long-haired counterparts. The shih tzu boasts one of the most beautiful coats of all canine breeds, with long, silky hair that brushes against the ground as they trot around the show ring. Caring for this coat requires a great deal of time and dedication, but puppies offer a simpler grooming routine. The adorable tiny size of your shih tzu puppy not only melts your heart, but also lets you bathe your little guy quickly and easily in a sink instead of the tub. Without the distinctive long, silky coat he'll get as he gets older, your shih tzu puppy should only require a bath about once a month or so, or whenever he gets dirty rolling in things he probably shouldn't. His shorter hair will make that monthly bath simple, as you just need to wet him down, lather him up and rinse him off. A quick towel dry or a few minutes with a hairdryer on a low setting and he'll be ready to play once more. Puppies are energetic and rambunctious little rascals, and they can get dirtier than you would expect. As you scrub your shih tzu puppy down, don't neglect his face and ears. Gently wash your puppy's mustache and beard to remove any leftover food that may have stuck, and wipe his ears out with a cotton ball. Only wipe the outside of the ear, and never insert anything down into his ear canal. Just because your shih tzu puppy's coat is shorter, that doesn't mean it doesn't need brushed. Hair of just about any length will mat when the dead hair falls out, meaning your cute little puppy could become a cute little walking mat as his coat sheds. 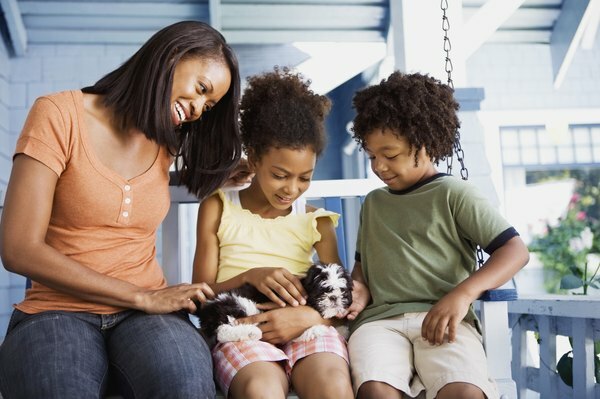 Brush your puppy at least once a week, more often if he's shedding, to remove all the dead hair and keep him mat-free. This will also get him used to the chore, which will serve you both well if you plan on letting his coat grow out as he gets older. Enjoy his fluffy puppy coat while it lasts, because once he hits about 10 months of age it will start to fall out and be replaced by his adult coat. He will need more frequent brushing and baths to prevent mats during this transition period, so adjust your routine as necessary. Brush him as often as necessary to remove as much of the shed coat as possible, otherwise you'll end up spending even more time working the mats out of him. This period of endless brushing should last about three months; then his adult coat should be grown in fully and you can adjust your new brushing routine as necessary. How Much Exercise Does a Shih Tzu Puppy Need? How Often Should You Walk a Shih Tzu Dog?